It was absolutely serendipitous that my paths crossed with Jennel and Byron in Kauai, who were the most amazing (and accommodating!) couple to photograph. First, they rescheduled our session after the ballistic missile scare, which was definitely needed! (I think I would've been too shaky still to get a good shot!) 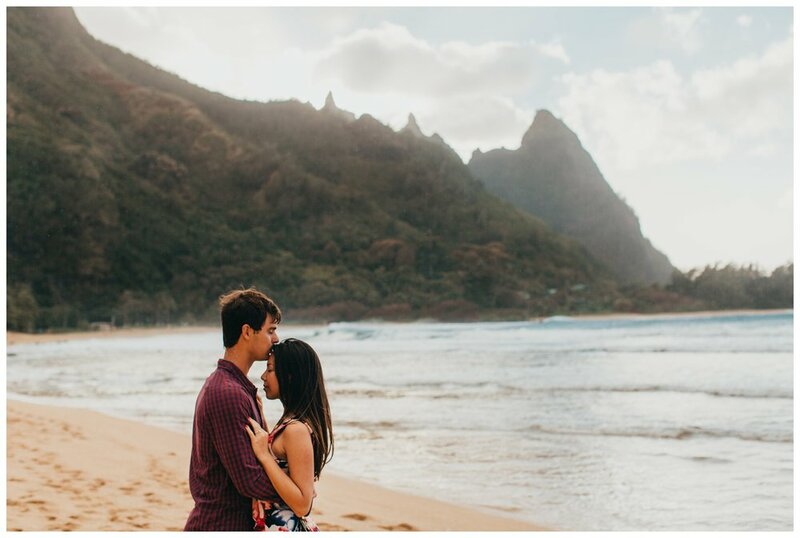 Then, they drove TWO hours to the north side of the island for our session. It was raining in spots around the island, including the location I'd scouted for our shoot. Byron grew up on the north shore and knew a bunch of great spots, and thanks to years of surfing, was able to read the weather and guess where we'd escape the rain. It was uncanny! We ended up at Tunnels Beach. The spot we were in was pure sun, but about 100 yards down the beach, you could see the rain coming down like crazy. And then in the other direction, we had a rainbow! You can't create cooler conditions than that! Thank you to Jennel and Byron! Congratulations on your engagement!